Gary Jardine believes Hibs and Edinburgh City can maintain a close working relationship which will be mutually beneficial to the Capital clubs. Hibs kids Ryan Porteous, Lewis Allan and Aaron Dunsmore all enjoyed loan spells with the League Two newcomers in the season just ended and City boss Jardine admitted he’d happily look to take more Easter Road youngsters under his wing in future. 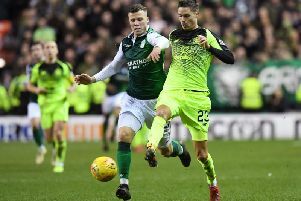 Although Dunsmore has been released by Hibs, Jardine believes 18-year-old defender Porteous is on the verge of forcing his way into manager Neil Lennon’s first-team plans, while 20-year-old striker Allan’s four goals in the second half of the season proved vital to City. Now Jardine is hoping the success those youngsters enjoyed at Meadowbank will persuade their city neighbours to allow others to head his way. He said: “I have a decent relationship with Eddie May [Hibs academy coaching manager] and he was kind enough to offer us some players. “Hibs want to get as many of their younger players out on loan to get experience because it is a massive jump from their development team to the Premiership where they will now be playing. Although, obviously, Jardine doesn’t have the biggest budget in Scottish football, part-time City made what he describes as a “small contribution” to each of those player’s wages but in return he insisted: “We were getting talented young players who are hungry to do well and they get the chance to play first team football, of playing against men. “Playing Ryan, who was just 17 when he came to us, was a bit of a gamble, but you have to trust your own judgment. He has done well alongside the experience of Joe Mbu and improved beyond what I expected, to be honest. “Aaron, I think, has been a bit unfortunate, but with quality Hibs have in the full-back areas he hasn’t had that opportunity. But he has always done well for us. It’s how he deals with being released but he has some really good attributes and I’d throw my hat into the ring if he was interested. “Big Lewis has been unlucky in being out injured long-term. He’d been on loan elsewhere but he came to us, got games and contributed massively to us staying up. He’s scored goals and set up others.